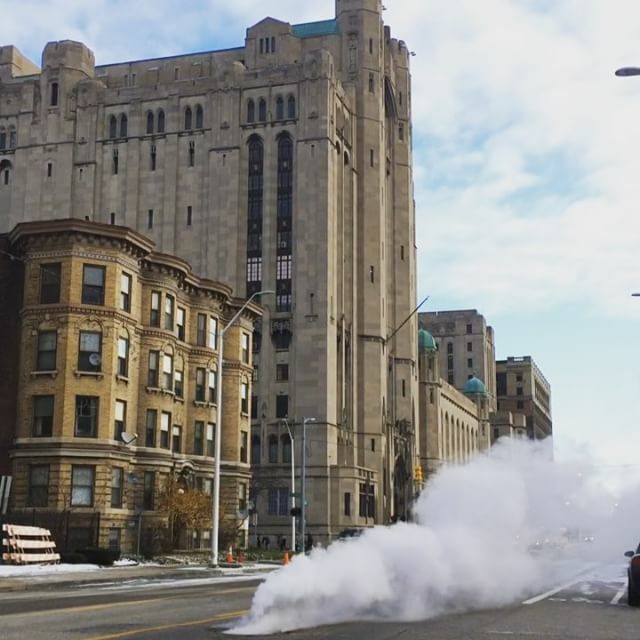 An iconic image of winter in Detroit is the columns of smoke spewing from sidewalks. Steaming streets are part of the landscape, but few know the answers that lie beneath this mystery in plain sight. Most buildings and homes have their own furnace or boiler, but properties on the district steam system connect to a grid that delivers steam directly to their pipes. It’s not so different from the way that most buildings receive electricity from a utility grid rather than having their own internal generator. District steam is common in dense urban areas with large buildings because a central plant can be more efficient than individual boilers. The current system serves more than 100 buildings in greater downtown, including the GM Renaissance Center, Cobo Hall, the Fox Theater, and Ford Field. But this type of system is limited for a reason: Heat escapes rapidly as the steam pipes pass by cold external air, so it is not suited for long distances. Detroit’s system is notable because it is so extensive — with over 50 miles of steam mains — and because it is so old. The system dates to 1903, when it was opened by Detroit Edison Electric Company. It’s also very leaky, as evidenced by all the steam seen rising from city sidewalks and streets. Minor perils aside, the steam itself is not all that scary. It is just hot water — not swampy sewer gas or exhaust from the forgotten Detroit salt mines. But upon solving that riddle, another one emerges: What powers the steam? And how can such a wasteful system survive? The steam loop originally ran on coal until it was converted to natural gas in the 1970s. When Detroit’s incinerator was built in 1986, garbage became the fuel du jour. It killed two birds with one stone by saving money on landfill tipping fees and generating fuel. The incinerator was based on the calculation that landfills would become more expensive over time, and that the ability to make trash disappear would generate revenue for the city. But as Detroit’s economy spiraled, the city lost residents. According to Detroit Thermal, the Detroit Renewable Power facility converts up to 3,300 tons of municipal solid waste per day. The combustion generates electricity (which is sold to Detroit Edison), and steam, which is delivered to Detroit Thermal. customer base was outside of the city — with some 66 percent of the waste burned coming from Oakland County and under 20 percent coming from Wayne County. Another 4 percent came from Canada. While the customers for much of the waste disposal are regional and beyond, the environmental consequences are local. Detroit Renewable Power has invested millions of dollars to improve the facility, including an upgrade to emission controls. Still, the system emits regulated particulates such as carbon monoxide, sulfur dioxide, ammonia, nitrogen oxide, and mercury. Adding insult to injury, service agreements with Detroit Renewable Power indicate the city pays higher rates to dispose of waste than the surrounding suburbs do. Detroit pays $25/ton while the Grosse Pointes pay $15.50 and Warren pays $15/ton. Many recyclable products are diverted to the incinerator as well. Zero Waste Detroit reports that one percent of our trash is recycled, while another 70 percent is incinerated. The State of Michigan further incentivizes this system by providing renewable energy credits for the electricity generated by the incinerator. Refuse-derived fuel is classified by the EPA as a renewable energy source because it is “sustainable and non-depletable.” Environmental groups consider the use of credits on waste-to-energy facilities as an affront to the intention of the law. The Detroit Renewable Power facility converts up to 3,300 tons of solid waste per day. The operating permit for the incinerator expired in August of 2016 and is up for review. Operations continue under an extension. The next step is for The Michigan Department of Environmental Quality to either approve or deny the permit application. MDEQ’s reluctance may in part be due to the work of Breathe Free Detroit, a group of environmental advocates that organized an information campaign on the issue. Breathe Free has called attention to the fact that Detroit children have the highest asthma rates of any American city as well as a lack of accountability for environmental violations (of a reported 379 exceedances over a two-year period, MDEQ penalized the incinerator for six). Several solutions could be realized by local government or ballot proposals. Wayne County and/or Detroit could amend their solid waste management plans to restrict or impose a tariff on the import and export of solid waste. Proceeds could be used to improve air quality. The City of Detroit could ban the disposal of its own trash to an incinerator within the city limits. MDEQ could deny the incinerator’s operating permit. It could also adopt a “supplemental environmental project” (similar to a community benefits mandate) to require facilities to reinvest in air quality provisions such as air filters in schools and in incinerator equipment. The State of Michigan could exclude waste-to-energy from the list of energy sources that are eligible for Renewable Energy Credits. In short, we need a system which penalizes waste rather than rewards it, and assigns a cost to the environmental debt it generates. In the meantime, the problems continue unsolved and largely out of sight. So, the next time you see steam emerging from the streets of Detroit, just remember that we can only sweep our trash under the rug for so long before we trip.